I know, I know. Another apple post this week, but I just couldn’t help myself. I might need an apple intervention. However, as luck would have it I am almost through my bushel. I really try not to overload the kids on sugary snacks, even for dessert. But again, I just couldn’t help myself. I reasoned that on a crisp, fall day nothing could taste better than some ooey, gooey blondies. Especially when they just scream fall. I also couldn’t wait until dessert to have the sons try them. So to celebrate hump day (I can’t every say that without hearing my kids, echoing that extremely annoying commercial) and good attitudes so far and to fortify them to finish the week out that way, we had them for an afternoon snack. Shh, don’t tell anyone. I don’t want the mommy-verse frowning upon me. We enjoyed these with a cold glass of milk, but warmed up and served with a scoop of vanilla ice cream they are to die for. We were in Fall Heaven! Preheat oven to 350 degrees. Spray a 9×13 pan with non-stick cooking spray. Add the brown sugar to the melted butter and stir until combined. Add the vanilla and the eggs to the brown sugar mixture. In a separate bowl, mix together the flour, baking powder, and salt. Add the flour mixture to the brown sugar mixture and stir until all combined. Fold in the apple and caramel baking bits. Scrape the batter into the baking pan and smooth the top using a knife or spatula. Bake for about 25-30 minutes, or until a toothpick inserted in the middle of the blondies comes out clean. 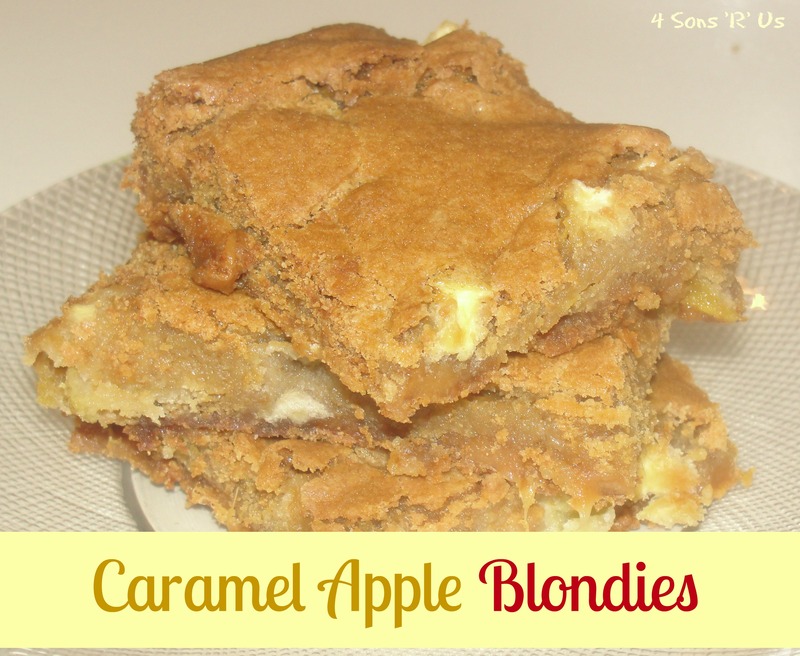 Let the blondies cool completely and then cut into large squares.